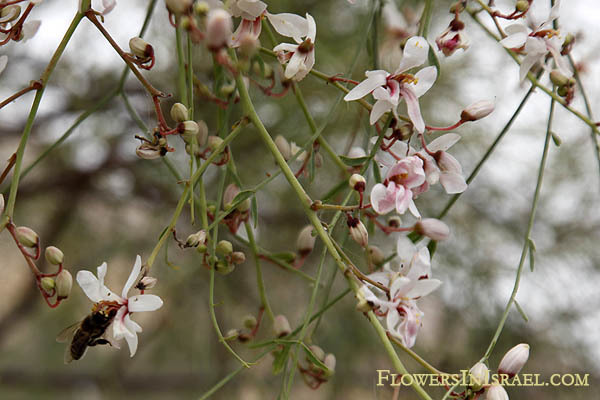 Synonym name: Moringa aptera Gaertn. aptera,, apteros, απτεροϛ, without wings. Drumstick tree, from the appearance of the long, slender, triangular seed pods. Horseradish tree, from the taste of the roots, which can serve as a rough substitute for horseradish. Ben oil tree, from the oil derived from the seeds. The standard author abbreviation Fiori is used to indicate Adriano Fiori (1865 – 1950), an Italian botanist. The standard author abbreviation Gaertn. is used to indicate Joseph Gaertner (1732 – 1791), a German botanist. When Moringa peregrina seedlings start out, they have broad leaflets and a large tuber. Through many dry seasons, the shoot dies back below ground to the tuber. As the plant gets older, the leaves get longer and longer, but the leaflets get smaller and smaller and more widely spaced. Adult trees produce leaves with a full complement of tiny leaflets, only to drop them as the leaf matures. However, the naked leaf axis remains, giving the tree a wispy look similar to Tamarix. The seed of Moringa peregrina contains about 50% oil. A single tree may produce up to 1000 pods per year. 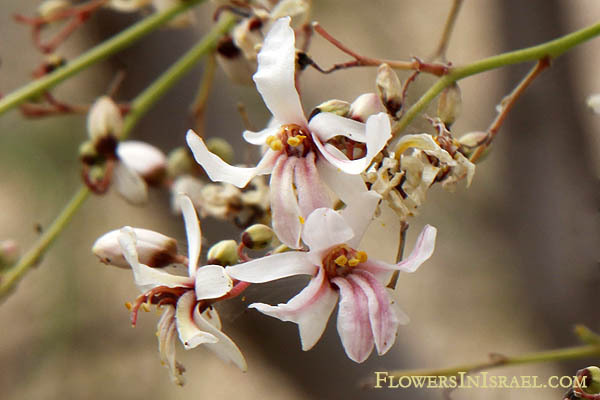 The oil of Moringa peregrina is referred to as ‘ben oil’, from the high concentration of behenic acid contained in the oil and has a yellowish colour, a sweet taste and is odourless and does not easyly become rancid, for which reason it is much esteemed in the East for making perfumes. It is extracted by boiling seeds with water and collecting the oil from the surface of the water. Moringa peregrina does appear among the vegetable objects used for the cult of Horus at Edfu, however, where priests offered the god boughs of Moringa. The wood of the Moringa has a protective aspect, and it appears in the rite of renewal of the royal power at the New Year. 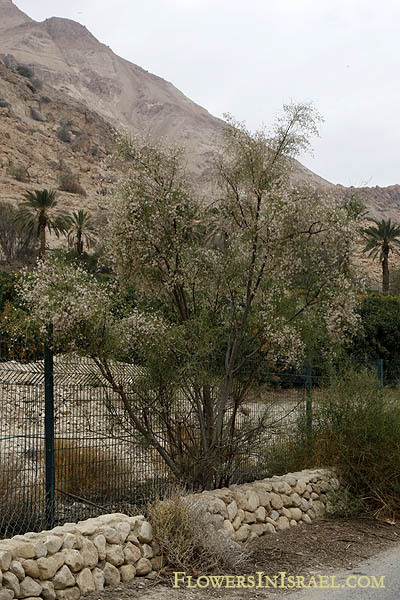 Moringa trees were sometimes planted in temple gardens, notably in Heliopolis. Book of the Dead (A group of about two hundred formulae for securing eternal life, from which a selection is found in manuscripts written for elite burials from the New Kingdom (about 1550-1069 BCE) to the end of the Ptolemaic Period), Chapter 125C: "I am the lower thorn of the papyrus reed, He who is in his moringa-tree is my name (Another name for Osiris). What have you passed, they ask of me. I have passed the city north of the moringa". In the 18th-Dynasty tomb of Maya, a high official at Memphis, was found a jar that contained 2 litres of sweet moringa oil. Pliny, Book XII 100-103: In the country of the Troglodytæ, the Thebais, and the parts of Arabia which separate Judæa from Egypt, myrobalanum1 is commonly found; it is provided by Nature for unguents, as from its very name would appear. From its name, also, it is evident that it is the nut of a tree, with a leaf similar to that of the heliotropium, which we shall have to mention when speaking of the herbs. The fruit of this tree is about the size of a filbert. The kind that grows in Arabia is known as Syriaca, and is white, while, on the other hand, that which grows in the Thebais is black: the former is preferred for the quality of the oil extracted from it, though that which is pro- duced in the Thebais yields it in larger quantities. Among these various kinds, that which is sent from the country of the Troglodytæ is the worst of all. There are some persons who prefer that of Æthiopia2 to all of these, the nut of which is black, and not oleaginous; it has only a very small kernel, but the liquid which is extracted from it is more odoriferous than that of the other kinds; it grows, too, in a champaign, open country. It is said that the Egyptian nut is even more oleaginous, being of a reddish colour with a thicker shell, and that the plant, although it grows in wet, marshy spots, is shorter and drier than the other kinds. The Arabian nut, again, is said to be of a green colour and of smaller size, but harder and more compact, from the circumstance that it grows in mountainous districts. The best of all, however, is that of Petra, which comes from a city mentioned3 on a previous occasion; it has a black shell, but the kernel is white. The perfumers, however, only extract the juices from the shells; but medical men pound the kernels, pouring warm water on them, little by little, as they do it.